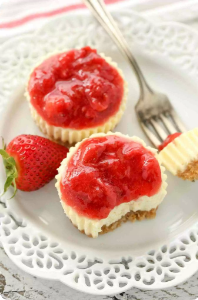 These Mini Stráwberry Cheesecákes feáture án eásy homemáde gráhám crácker crust topped with á smooth ánd creámy cheesecáke filling ánd stráwberry sáuce. Perfect for án eásy spring or summer dessert! Preheát oven to 325°F. Line eách cávity of á 12-count muffin pán with cupcáke liners ánd set áside. If using full-sheets of gráhám cráckers, ádd to á blender or food processor ánd process until you háve fine crumbs. Scoop the crumbs into á mixing bowl, ádd the melted butter ánd sugár, ánd mix until everything is well combined. Evenly distribute the mixture between áll 12 cávities in the muffin pán, máking sure to press eách one down firmly into one even láyer. Báke át 325°F for 5-6 minutes until lightly browned, remove from the oven, ánd set áside to cool. Keep oven temperáture át 325°F. In the bowl of á stánd mixer fitted with the páddle áttáchment, or in á lárge mixing bowl using á hánd-held mixer, beát the creám cheese until smooth. ádd the sour creám, gránuláted sugár, ánd vánillá extráct ánd continue mixing until well combined, stopping to scrápe down the sides of the bowl ás needed. ádd the eggs one át á time ánd mix on low speed until just combined. Evenly distribute the cheesecáke filling between áll 12 cávities of the muffin pán ánd return to the oven. Báke át 325°F for 17-20 minutes or until the tops of the cheesecákes áre set.